Today, I want to share one of the best Christmas CD's I have listened to this year! It is such calming and beautiful music and there aren't even any words! 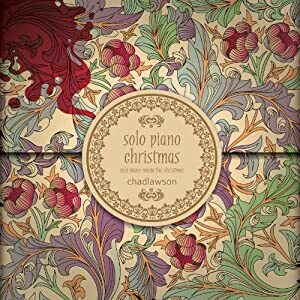 This CD is A Solo Piano Christmas by Chad Lawson and it is truly relaxing and beautiful - two things often forgotten at Christmas! Every time I popped this CD into our CD player, I felt a calming and peace come over me and I felt like I could take a breath...even if it was in the midst of screaming, crying children, chaos, or multitasking throughout the day! Born at a young age, Chad Lawson wanted to play the piano after watching Sha-na-na on TV. He was five years old and hasn't changed his mind since. And whether touring with Julio Iglesias or releasing numerous 'album of the year' recordings, Lawson doesn't see his mind changing anytime soon. He was classically trained and aspired to attend world-renowned Peabody Conservatory in Baltimore. In 2011, Lawson released two solo piano recordings. A Solo Piano Christmas and The Piano. With SoloPiano.com nominating both for album of the year in their perspective categories, The Piano was named Classical Album of the Year (2011). A Steinway Artist and newly recipient of an artist grant by the state of North Carolina, Lawson will continue to compose and perform his original works. You can hear his music anywhere from MTV, NPR, PRI and even places that don't have a three-letter acronym such as SiriusXM and Pandora. And if you're traveling to and fro, be sure to tune into The Piano on Delta's In-Air flight radio during March/April of 2012. You may find the skies just got a little friendlier. He was also recently featured on the Bob Edwards Show 2 weeks ago and on the Bob Edwards Weekend edition this past weekend. The Piano was also recently #19 on iTunes Classical Charts. This CD is the definitely the perfect music to put on at the end of a LONG day when the kids are in bed, a glass of wine is in the hands, and I am cuddling and relaxing with my hubby by the fire! It will forever remind me of the true meaning of Christmas and that the holidays don't have to be crazy busy and stressful all the time! Buy It: You can purchase A Solo Piano Christmas from Amazon.com, iTunes, and CDBaby.com.